The Laboratory of Feminist Pataphysics (LFP) proudly presents its latest Prototypes for Ateliers of the Near Future at Stride Gallery in Calgary from April 16 to May 28, 2010. LFP's founder, Mireille Perron created a series of 13 small-scale models of Ateliers of the Near Future. Not fearing time wrap, she invited 13 emerging artists* to propose work in response to the imagined facilities. Artists have a long history of creatively using objects, building, and structures discarded of left vacant during economic downturns. Moreover, there is a long imaginative tradition involving the fabrication of prototypes and models for alternative ways of working/living/being. 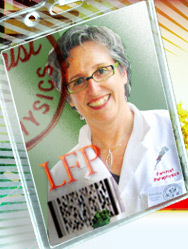 LFP's series of ateliers pursue and combine these two traditions. Tin toys mostly intended for little girls have been saved from disgrace. Metaphorically they stand for the remains of previous eras. This deviation from their previous function allows them to form the core of Ateliers for the Near Future. Ateliers representing a vast range of practices such as fibre/textiles, ceramics, glass, jewellery/metals, photography, printmaking, creative writing, film, digital, and mixed-media are portrayed. The diversity of artistic practices is celebrated for its ability to combat rampant corporate conformity leading to a stunting of creative potential. Most Ateliers of the Near Future include gardens as part of their experiment with the cultivation of various aspects of the self. LFP's ateliers are neither utopian nor dystopian models. They demonstrate the same ingenuity and resourcefulness artists perform daily "making due" while salvaging the wreckage left behind by neo-liberal economies. * Bee Kingdom: Philip Bandura, Tim Beliveau & Ryan Marsh Fairweather, Lisa Benshop, Roxanne Driediger, June Hills, Kim Johansen, Eveline Kolijn, Isabel Landry, Alex Moon, Melissa Pedersen, Mikhel Proulx and Romy Straathof. LFP encourages you to plant these mesclun seeds, grow them with TLC, and savour the resulting salad of various greens. Mesclun seeds: Mix of greens for salad. Plant seeds after last frost, sow ¼ inch deep. Keep seedbed evenly moist until seedlings emerge in 1 to 2 weeks. Cut and grow again a few times before replanting.